What do you do when your language is classified as "critically endangered" by the United Nations? You take action. At the age of 84, Katrina Esau and her two sisters are the last three speakers of N|uu, one of the languages spoken by South Africa's San community, also known as Bushmen. 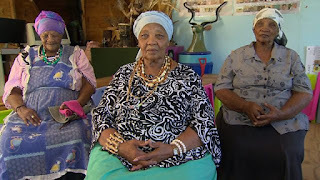 The BBC's Pumza Fihlani met the three sisters who have now taken it upon themselves to save their mother tongue by teaching the 112 sounds and 45 distinct clicks of N|uu to a group of local children.